"Hava Nagila, Have Nagila, Hava nagila ve nis'mecha" Sorry, a little NHL '94 organ music flashback. Now, I'll admit my exposure to all things kosher is very limited. I had a friend who once dumped gefilte fish down the heater when he moved out of his dorm room and another who became enraged when he found out the Dunkin Donuts up the street from our apartment was kosher and he couldn't get a bacon, egg and cheese sandwich one morning whilst hungover. 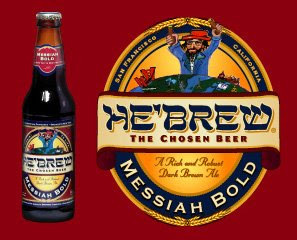 See, not too much experience with the kosher stuff, yet I managed to pick up a bottle of Shmaltz Brewing's He'brew Messiah Bold brown ale. Now, I figure when you start putting limitations on ingredients and preparation, you're gonna be disappointed in a product, kind of like sugar free candy or fat free cookies, not so with the Messiah Bold. There is a strong chocolate malt flavor which ends a little sweet. Despite the strong chocolate taste, the texture is very light. When I tried the Messiah Bold, I had it very cold, but think that this beer could possibly taste better if it were a little warmer. Did I mention that this beer is "Kosher Certified Rabbi Approved?" Also, the label is pretty sweet too. And despite its kosherness, it packs a 5.5% ABV wallop. The Messiah Bold gets a 3.5. Hey BC. This is Zak Davis from Shmaltz Brewing Company. Thanks so much for the great review. I'm really glad you enjoyed Messiah Bold, I do too. Beer is generally considered kosher no matter what, since the four main ingredients (water, yeast, malts, hops) come from the earth (unlike meat or dairy). Mainly, the certification process makes sure that nothing is happening during the brewing process that could contaminate the beer (IE: No one is eating BLTs over the kettle). You can imagine how often we're asked if the beer is kosher. It's much easier to just say "yes" than it is to lay out the whole story. L'Chaim!! And I agree, that was the worst living down the street from the only kosher dunkin donuts in massachusetts. a drunk man needs chinese food and a hung over man needs a bacon egg and cheese..